I am in Naples and Ischia with my parents for the month of May so have decided to Highlight some of my favorite Italian vegetable dishes. Bruschetta is ubiquitously loved and is basically Italian tastes on toast. They are adabtable and often memorably delicious yet incredibly simple. I recently made for a Roman themed meal and served a variety of Bruschetta as an antipasto. Everyone seems thrilled. Here is a simple tomato, basil bruschetta recipe with truffle oil that is always a big hit. There are hundreds of vegan adaptable toppings that can be made with seasonal veg and creative flair. The old faithfuls are tomato, pesto, and olive salsa's. Tomatoe Topping - Mix four finely chopped Roma tomatoes room temperature, two medium cloves of garlic, four thinly sliced leaves of basil, a generous pinch of salt and slathering of olive oil, truffle oil if you have it. Set Aside to meld. Slice Baguette into thin slices, toast both sides, rub with a garlic clove, spoon on seasonal topping and serve. 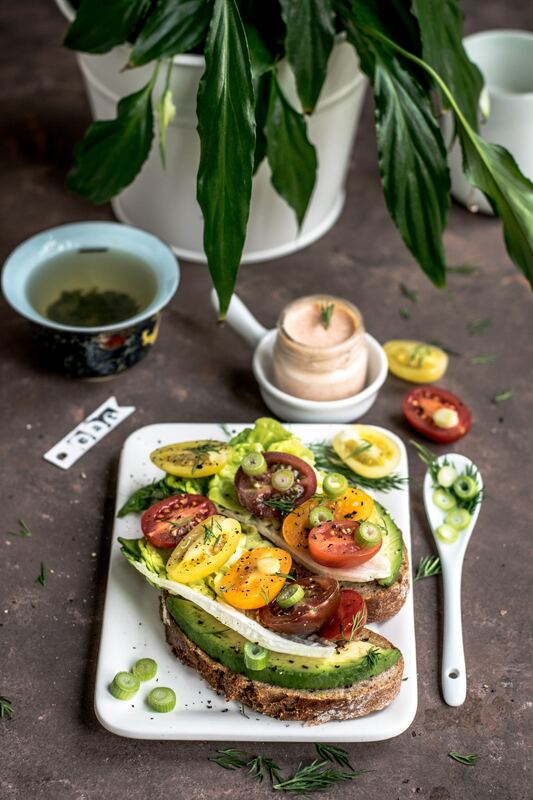 Shown above in the photo by Monica Grabkowska is a take on the traditional Italian Bruschetta made with dill, fresh garden tomatoes, fennel and little gem lettuce, drizzle with olive oil, salt to taste and you have a bit of heaven on your tongue.